If you’re trying to record your screen but are beginning to feel frustrated by the fact that it all seems so technical and dense – you need to look at the software you’re using. 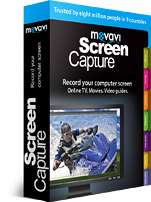 While video capture software generally has a pretty bad reputation for being difficult to use, the Movavi Screen Capture flies in the face of all that and emphasizes a user-friendly approach to screen capture. Because it is designed with an intuitive user interface, you will be able to pick it up and use it without having to worry about running into a steep learning curve. Using its features will almost feel natural due to the fact that they mimic processes that you’re already used to – such as resizing the capture region by dragging the edges. But don’t be fooled by its simple exterior. Under the hood the Movavi Screen Capture is a screen capture software that has all the bells and whistles you could ever need and will allow you to exert control over your recording to ensure that it turns out the way that you want it to. Defining the recording area to a specific region of the screen or the entire screen. Selecting the audio source to record the system audio or audio from another source such as a microphone. Adjust the frame rate to be high and have smooth playback or low and conserve space. Choose whether to capture keyboard and mouse actions. Conveniently optimize and save your video with the help of presets that will automatically configure the best settings for any device or platform – including mobile devices and online video sharing websites such as YouTube and Facebook. Don’t be daunted by the range of options however. If you’re new to screen capture you could get away by simply hitting the ‘REC’ button – whereas as you get a bit more experienced you may want to set up the recording as and how you see fit. The best way to see just how user-friendly the Movavi Screen Capture is would be to try it firsthand. Go ahead and record your screen using it at least once to get a feel for its user interface as well as its features. In no time you’ll be able to competently capture videos, and shortly after that you may even be giving professionals a run for their money with the quality of videos you’re able to record.